The English Symphony Orchestra are proud to announce the appointment of Michael Young in the newly established role of Assistant Conductor. Michael has an enviable CV. 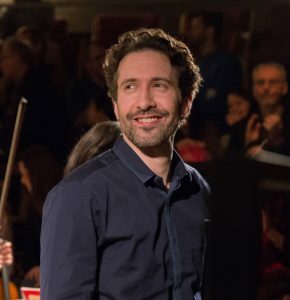 He is the is co-founder and Artistic Director of the Beethoven Orchestra for Humanity – a new kind of professional chamber orchestra and immersive concert experience ‘fusing topical talk and classical music for today’s world.’ Michael has also been Music Director of Charities Philharmonia, London Youth Opera and Little Operations. He has won several prizes at the Leeds Conductors’ Competition and the Ninth International Pedrotti Conducting Competition. In the UK Michael has worked with the English National Opera, London Philharmonic Orchestra, Grange Park Opera, Fabulous Beast Company, Sinfonia Viva and the Orchestra of Opera North. He has also assisted Vladimir Jurowski, Bernard Haitink and Ed Gardner. Overseas Michael has conducted orchestras including the Orquesta Sinfónica Nacional del Perù, Orquesta Ciudad de Granada, Ruse Philharmonic Orchestra, Orchestra Haydn di Trento e Bolzano and the Ensemble Zandonai. “We strongly believe in building relationships with soloists and composers we believe in and one couldn’t help but be impressed by Michael’s superb natural musicianship and his openness to learning and taking on new ideas. Having worked together at the Colorado MahlerFest, I invited him to be an assistant conductor for the ESO’s recent world premiere and recording of John Joubert’s Jane Eyre. Michael has a keen ear for detail and he proved himself an expert rehearsal pianist, quickly earning the total trust of the singers. His detailed work on proofreading the newly-created scores and parts of this huge work helped enormously. There are few areas of our industry that are more difficult to break into than the world of professional conducting. We hope that our new Assistant Conductor position will offer Michael and his successors, not just a chance to learn and observe, but also a platform to show the industry what they are capable of at an elite level. This position is designed for conductors who are ready to take that next big step forward in the industry. This new appointment caps a remarkable year for the English Symphony Orchestra receiving multiple awards and widespread critical acclaim for their series of concerts . Their recording with Mikhail Korzhev, Krenek Piano Concerti vol. 1, was awarded the Sunday Times “Best of the Year’ for 2016 and their concert performance of John Joubert’s opera Jane Eyre received rave reviews and earned them Classical Music Magazine’s “Premiere of the Year” for the second year running. Have a project and want to work work with us?